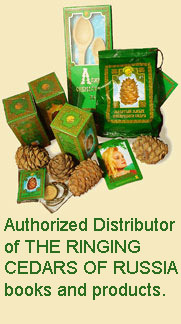 www.ringingcedarsusa.com is the authorized distributor of Ringing Cedars of Russia. "Only people may be offered a counterfeit," I voiced my concern to the old fellow. "Well, then, you and i will make a device to screen out counterfeits." - Vladimir Megre, book 2 "The Ringing Cedars of Russia". Special steps have been taken to protect "THE RINGING CEDARS OF RUSSIA" cedar nut oil against counterfeit. First, the package features a small calendar with a portrait of Anastasia. Second, the package contains THE RINGING CEDARS OF RUSSIA brochure. 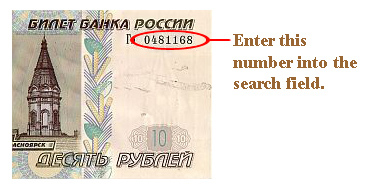 Third, each box contains one half of a ten-rouble note with an official registration number. The second half of the note is retained by ENERGY OF LIFE INC., the official representative of THE RINGING CEDARS OF RUSSIA. On this page you can verify the authenticity of the product which you have purchased. If your package with the Siberian Nut Oil (Pine Nut Oil) does not contain the items above, then your Siberian Nut Oil (Pine Nut Oil) is not genuine. Still have a question? Please send us a letter.